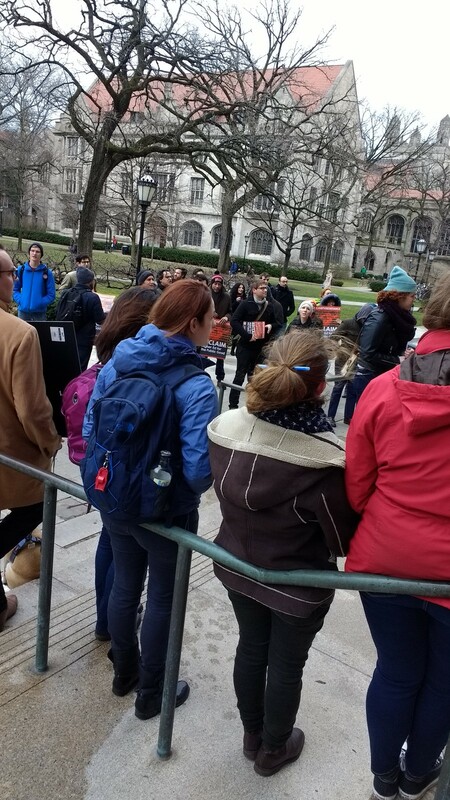 Students and faculty gathered Wednesday to protest for higher graduate student employee pay rates, better treatment of non-tenure-track faculty, and improved health care for students and workers as part of a nationwide series of university protests. The protests—organized under the hashtag #CampusResistance—were coordinated by the Service Employees International Union (SEIU) to protest Trump’s so-called “corporate cabinet” while advocating for higher wages for educators, according to the union website. Senior Lecturer Jason Grunebaum is a member of the bargaining team of UChicago Faculty Forward, a group in the process of unionizing which supports non-tenure-track faculty. Grunebaum led the group in chants and introduced each speaker. Tae Yeon Kim, a second-year year medical student, claimed she was addressing the protesters on behalf of fellow medical students. Ph.D. candidate Trish Kahle said she was speaking on behalf of Graduate Students United. She said that the University continues to make budget cuts, which she said impact health care coverage for non-tenured faculty, despite having enough money to avoid these cuts. Student Government President Eric Holmberg spoke as a representative of Fair Budget UChicago, which advocates for a $15 minimum wage and accessible student disability and student counseling services. Stephen Clarke, a member of Local 73, said he attended the rally to demonstrate trade workers’ solidarity for teaching assistants. "The narrative around Trump being similar to Zimmer came out really well."